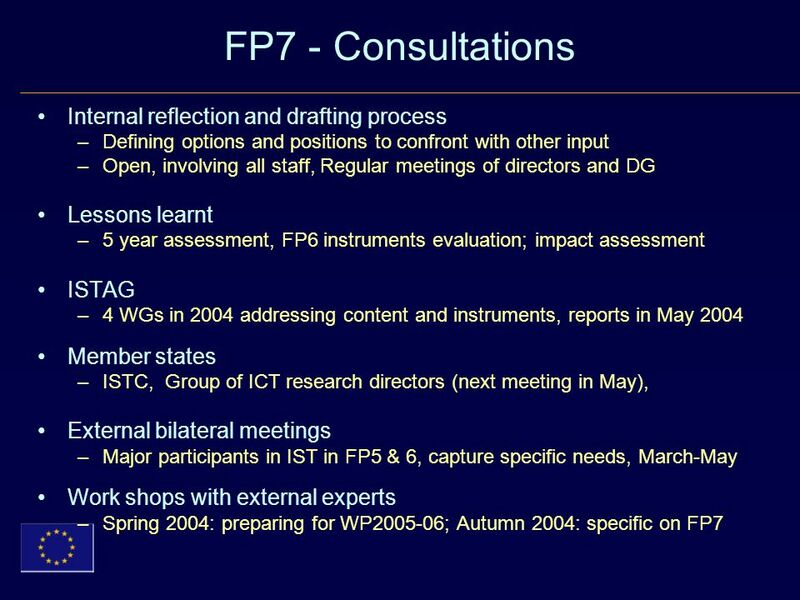 FP7 Preparations ISTC meeting 31 March 2004. 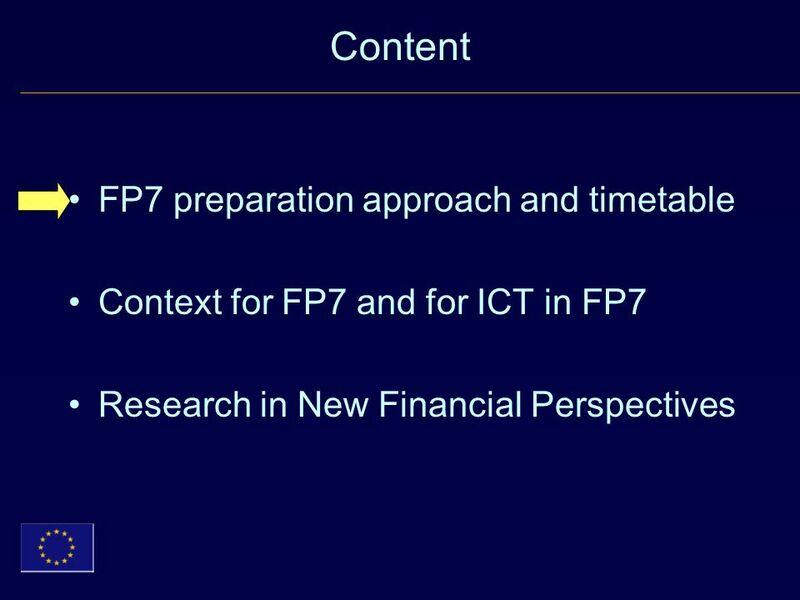 Content FP7 preparation approach and timetable Context for FP7 and for ICT in FP7 Research in New Financial. 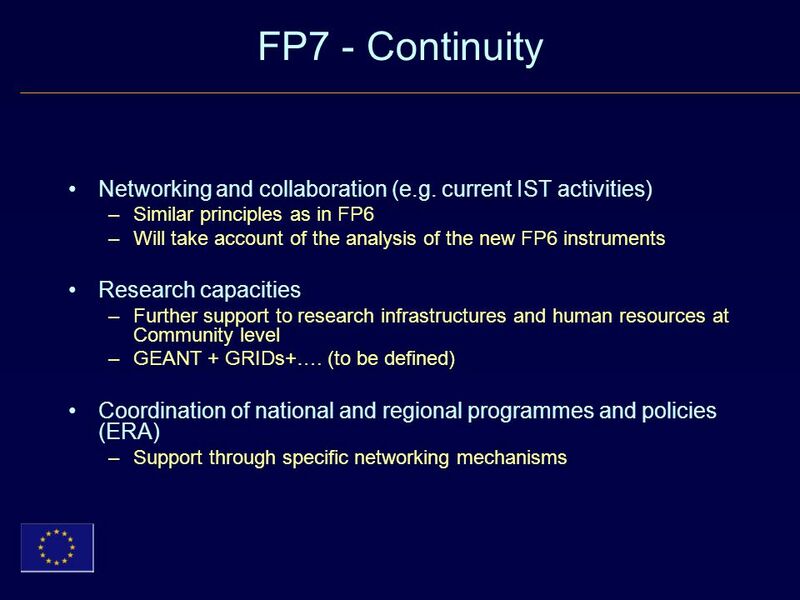 3 FP7 preparations in DG INFSO: A three pronged approach Develop main orientations of FP7 –In association with DG RTD –Maintain momentum for research as agreed in New Financial Perspectives Elaborate ICT research strategy beyond 2006 –Objectives, content, instruments, constituency Build the bridge FP6-FP7 –IST Work Programme 2005-06 –Review of new FP6 instruments, 5 year assessment, etc. 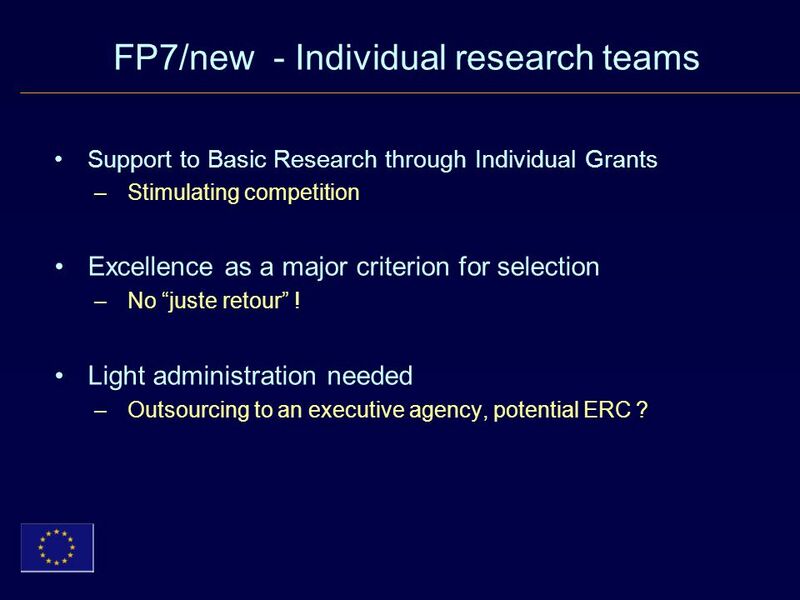 14 FP7/new - Individual research teams Support to Basic Research through Individual Grants –Stimulating competition Excellence as a major criterion for selection –No “juste retour” ! Light administration needed –Outsourcing to an executive agency, potential ERC ? 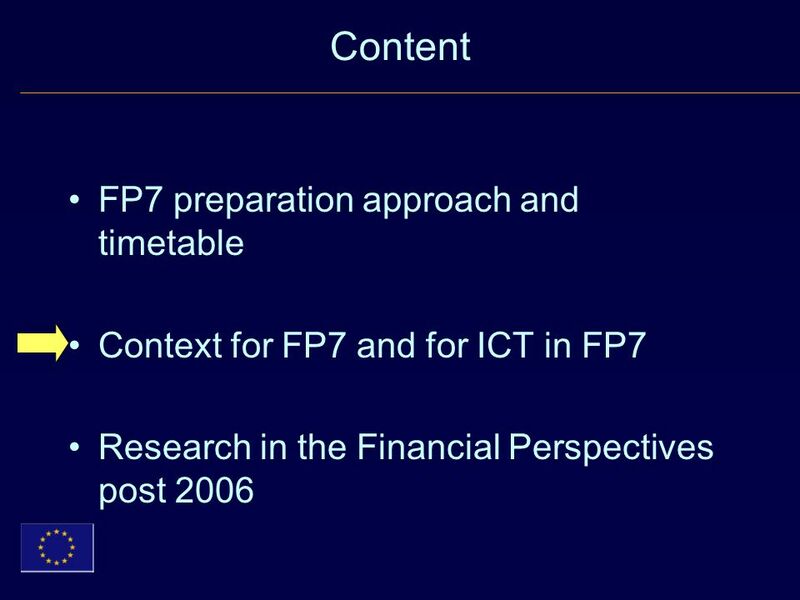 Download ppt "FP7 Preparations ISTC meeting 31 March 2004. 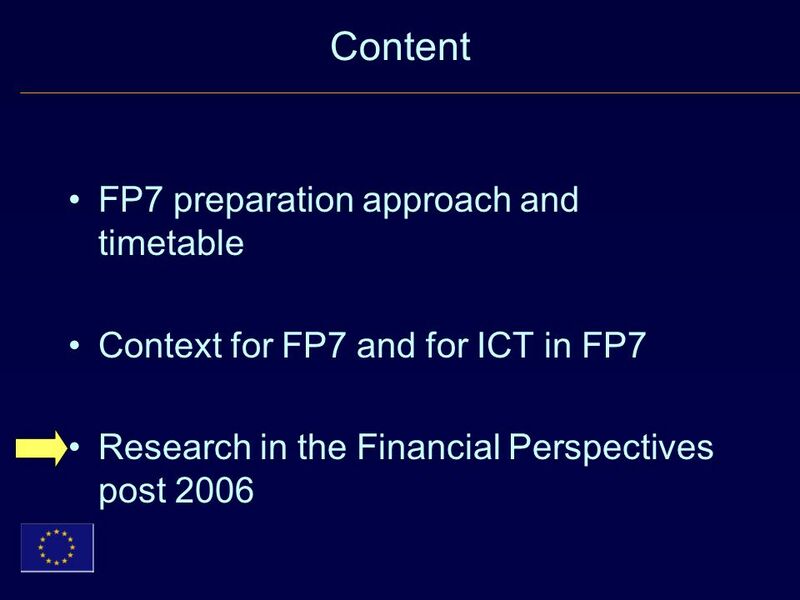 Content FP7 preparation approach and timetable Context for FP7 and for ICT in FP7 Research in New Financial." Research Infrastructures in the European Research Area Presentation NuPECC LRP 2010 Brussels, 9 December 2010 Christian Kurrer European Commission, DG. 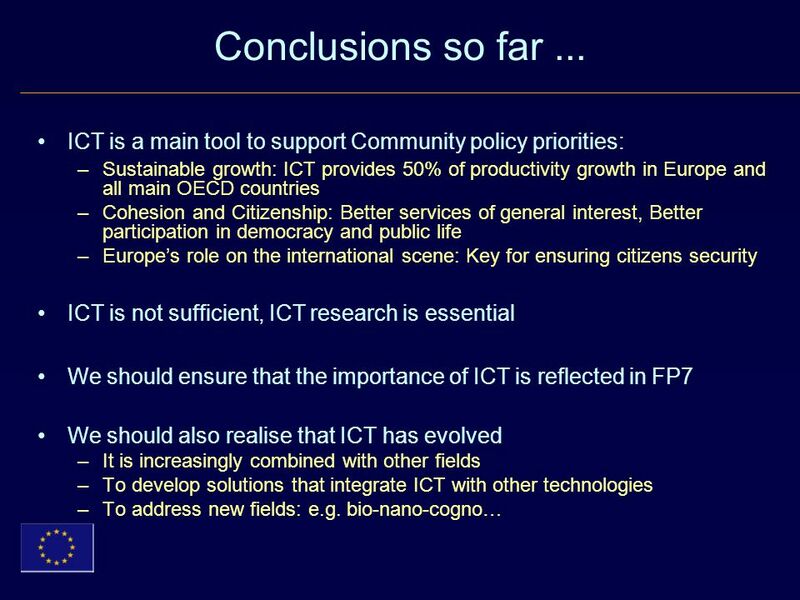 European Research Policy: from coordination and cooperation to integration and the ERA Dr. Maria Nedeva MIoIR, MBS. The University of Manchester EULAKS. 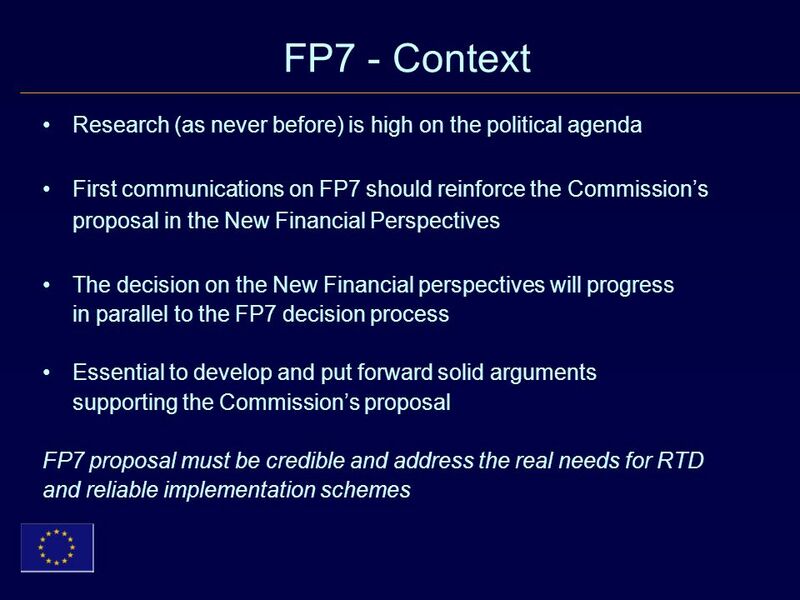 The future of EU research Rudolf Meijer, European Commission Prague, 26 May 2004 Annex X. Slide 1 Research in support to Human Biomonitoring E&H, Consultative Forum Meeting 19 October 2005 Luxembourg P. Valette DG Research, Directorate Environment. 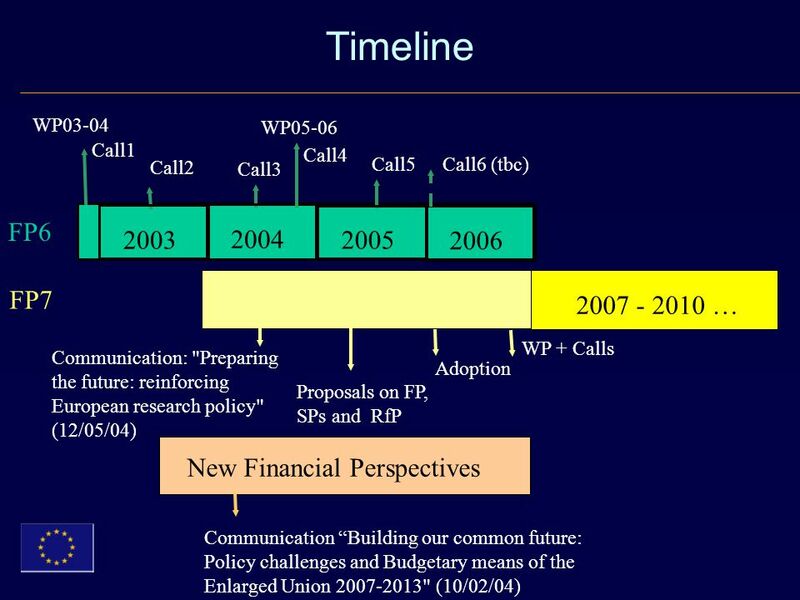 IST99 Helsinki WP2000: The process IST Programme Prof. G. Metakides Director DG INFSO/E. 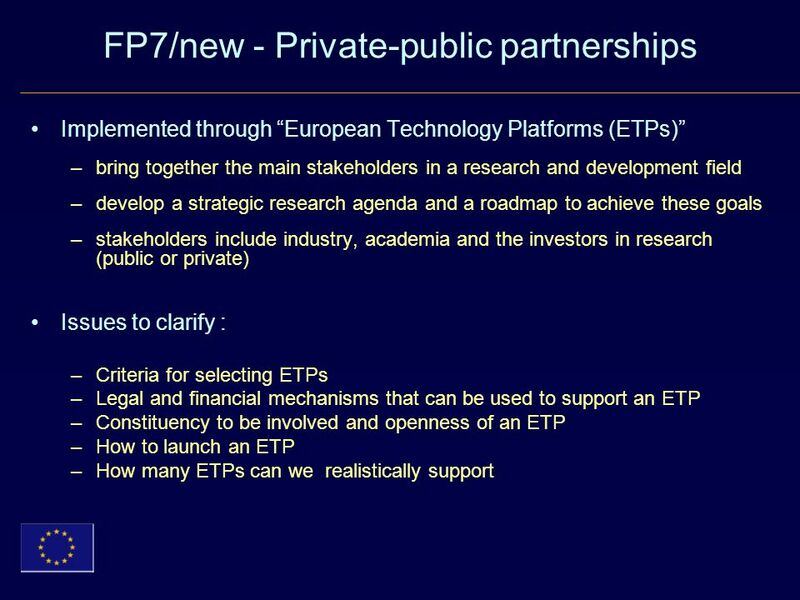 1 Barcelona, 9-10 September 2004 View of the European Commission Support for Basic Research Dr. Erika Szendrak RTD B1 – Anticipation of scientific technological. 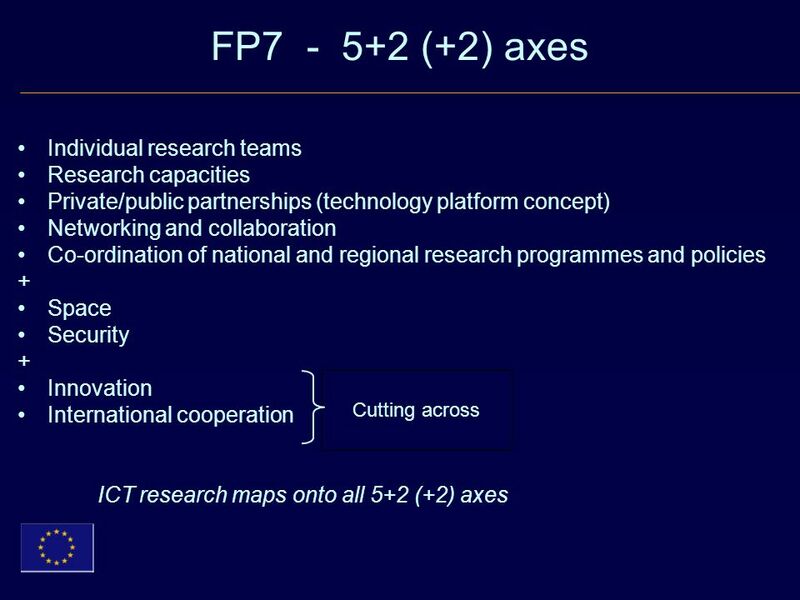 1 Conference, How does research integration work? 17 June 2008 The issue of ‘research integration’ and the role of IPs and NoE in the social sciences and. 1 European Policies to Promote EST into the Market INSTITUTO SUPERIOR TÉCNICO RGESD - Research Group on Energy and Sustainable Development Maria da Graça. 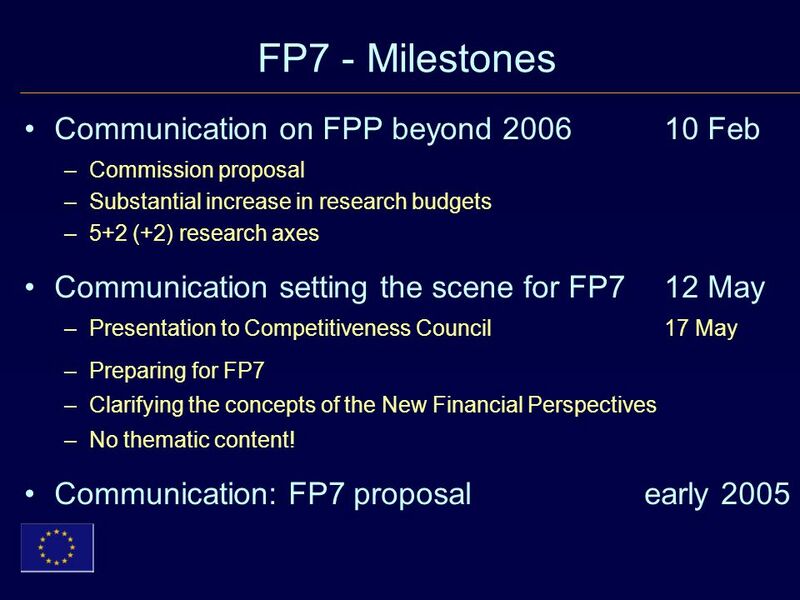 1 FP6 into perspective. 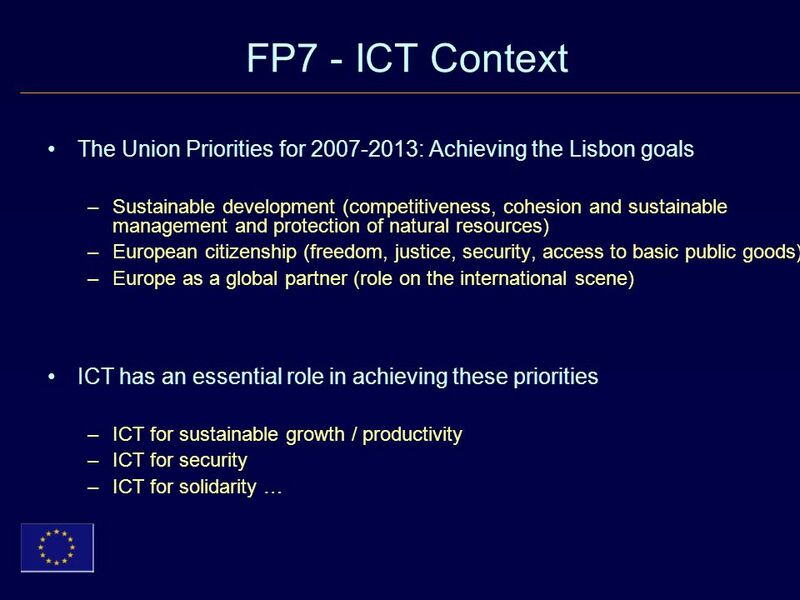 2 Understanding the context and exploiting the opportunities FP6 into Perspective The European Union.